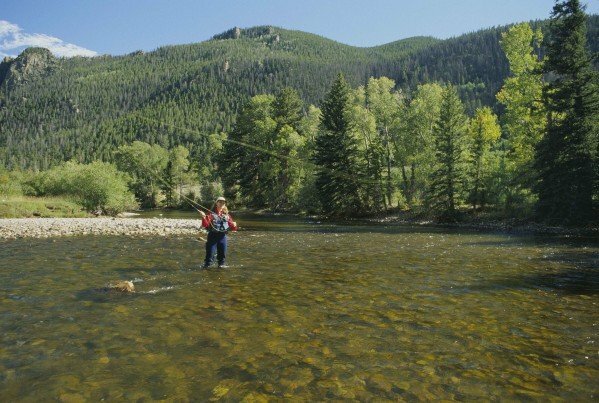 For many fly fishermen, the age-old craft is a simple endeavor. Tie a small fly to a tapered leader and let the casting begin. The method works fine. But what if I told you there was a way to double your chances of catching fish and it involved a tandem fly rig? The truth is, anglers have been using tandem fly rigs for hundreds of years. The method just doesn’t get mentioned in much folklore because many anglers view it as sort of off-limits, like it somehow diminishes the sportiness of the endeavor. But nothing could be further from the truth. In order to fish with a tandem fly rig, it’s a simple task. Just slide the fly you want on the top up the leader. Then pinch a loop around the fly, pulling the line from either end so that the fly is at the middle of the loop. Then simply tie it off like you would a drop shot. Position this top fly about six inches above the bottom fly, which you can tie on using your preferred fishing knot. The idea is that you now have two chances to attract the attention of a fish. Now comes decisions. Which flies should you use? If you have no idea what flies are hitting in one particular area, this is where tandem fly rigs can come in handy because you can experiment with two different flies at once. If neither are working, try a different set of tandem flies. If you do have a good idea what’s striking, go ahead and tie the same two flies on the line. This will most assuredly lead to a fish on the line. Another good method is to place a heavier fly at the bottom end and a larger and lighter fly at the top. In this way, the second fly can serve as a kind of float that’s both visible to the angler as well as the fish. And the heavier fly makes casting the second one easier.